If science fiction stages the battle between humans and non-humans, whether alien or machine, who is elected to fight for us? In the classics of science fiction cinema, humanity is nearly always represented by a male, and until recently, a white male. Spanning landmark American films from Blade Runner to Avatar, this major new study offers the first ever analysis of masculinity in science fiction cinema. It uncovers the evolution of masculine heroes from the 1980s until the present day, and the roles played by their feminine counterparts. 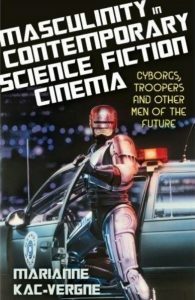 Considering gender alongside racial and class politics, Masculinity in Contemporary Science Fiction Cinema also situates filmic examples within the broader culture. It is indispensable for understanding science fiction and its role in contemporary cultural politics. Marianne Kac-Vergne is Lecturer at the Universite de Picardie Jules Verne in Amiens, France, where she teaches courses in American cultural history at graduate and undergraduate levels. Her research focuses on gender and genre in American cinema, and she has published and presented on masculinity and femininity in science fiction, romantic comedy and western films.